A dollop of sweet, yummy goo made by bees—sounds pretty nice, and maybe a bit messy, but will it help stop an infection? Perhaps. The age-old elixir may actually be a modern day remedy for wound healing, as antibiotics become less able to handle the infections we see. Who Thought of Using Honey on Wounds? Honey has been used since ancient times, from Egypt to China to Greece to the Middle East. It was used to treat sore throats, but also, at times, wounds. Today, it's used anywhere from San Francisco to Northern Nigeria. However, honey hasn't always been recognized as beneficial in wound care. In the past, it was seen as a natural remedy with little value. For years, it was not part of standard medical practice. Sterile honey was licensed for use as early 1999 in Australia and bandages with honey were licensed in the UK in 2004. The medical honey business is now worth millions of dollars for some companies. There is growing evidence that honey does help with wound healing when placed on wounds. Many health practitioners use it in established medical facilities. However, given all of the different types of wounds, it is hard to gather the evidence and run the clinical trials needed to evaluate honey in all of these different settings. The Cochrane Review, an important independent review group, reports: "Honey appears to heal partial thickness burns more quickly than conventional treatment (which included polyurethane film, paraffin gauze, soframycin-impregnated gauze, sterile linen and leaving the burns exposed) and infected post-operative wounds more quickly than antiseptics and gauze." 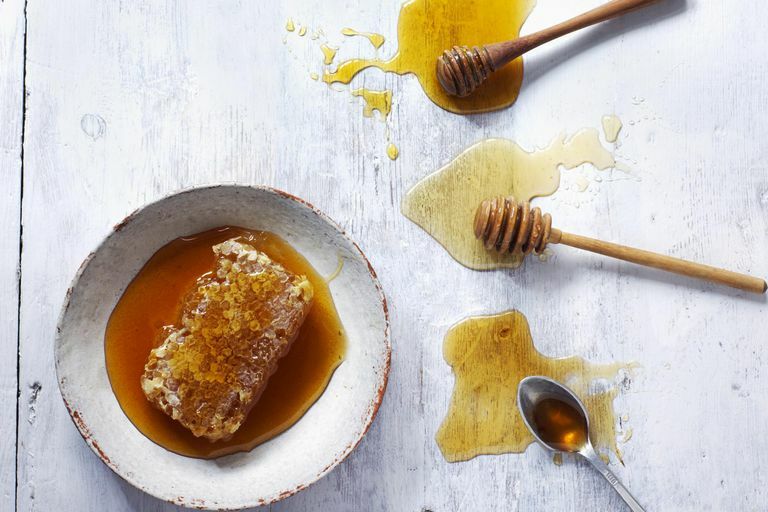 This means that when multiple studies were analyzed, the Cochrane Review experts saw that honey was helpful for some types of burns, even better than some common treatments, and that post-operative wounds improved with honey faster than with gauze and common antiseptics alone. There are particular types of honey that are used more often than others for wound healing. Research is still being done to determine what works best. Honey should be medical grade honey to avoid worries that it has bacteria or other additives or added allergens in it. Many use medical grade honey that comes from Leptospermum honeys like manuka and jellybush honey. Although honey does not support bacterial growth, it does contain spores. These spores can sprout into bacteria that can cause diseases like botulism, which we don't want. Botulism is also why parents are told not to feed their babies honey. Medical-grade honey is treated (or irradiated) to ensure there are no spores, and also to ensure that no other disease-causing agents are present. You also don't want sweet, uncovered honey that attracts flies or insects to a wound, so using bandages with medical grade honey and prepared gels that include medical grade honey is the way to go. Is Medical Grade Honey Edible? The honey discussed here is for placing on wounds, not for eating. Honey has sugar in it, and high levels of sugar are not helpful when treating infections, especially in those with diabetes. Bacteria doesn't grow well in honey. This is one of the reasons why honey can be helpful for wounds. In a way, the honey smothers bacteria. There are a lot of reasons for this. Honey isn't particularly wet. It contains very little water, which the bacteria would need to grow. Honey also contains hydrogen peroxide (H2O2) which helps fight bacteria. This is because the bees swallow the nectar and in their stomachs is an enzyme (glucose oxidase) that makes H2O2 (and gluconic acid) from the nectar, which the bees then regurgitate up, ending up in the honey we use. Honey is also very acidic. Its pH is about 3.9 (sometimes lower, sometimes higher, but always well below 7.0, the cut off point for something to be basic instead of acidic). This is also a great mixture because it's not too strong. Straight up H2O2 would be too strong for wounds, damaging healing tissue. Too acidic a substance would also damage young, growing tissue. Burns can be more serious than they seem. Burns that don't hurt so much can be the most damaging. If you have an infected or very dirty wound, you may need surgery, debridement by a medical professional, and/or antibiotics. It is best not to wait and honey can't replace this. Stitches may also be needed. If they are needed, the wound needs to be closed soon after injury, because of infection risk. It's important to have this done within hours and definitely within the same day. A puncture wound, such as a bite from a cat's long incisors or from stepping on a nail, may be more serious than it seems. You may need to have further treatment—antibiotics, a tetanus shot, debridement, or removal of foreign material that you can't see. It's important that a wound is fully cleaned. If there is foreign material lodged in the wound, it's important to seek help in cleaning this wound. Wounds can also be more serious if you are diabetic or immunocompromised. And do not forget your tetanus shot if you are not-up-to-date. Check if you've had a vaccine in the last 5 years if you have a dirty or serious wound. Keep wounds clean. Talk to a medical professional about how best to do this. It's also important that wounds do not dry out. Bandages can help keep them moist, without drying too much, and a health professional can help with this. It's also important to seek help with wounds, such as burns, that can stiffen and which may need help to keep tissue from contracting and becoming too tight as they heal. It's important also to use precautions when handling wounds. You do not want to introduce bacteria or other germs into a wound, such as from your hands or even from gloves or bandages. You also do not want a wound to infect you. Use universal precautions when handling any open wounds, blood, or other body fluids from someone else to avoid any risk that you could be infected with any sort of infectious pathogen. This means using gloves when handling any sort of body fluid or open wound. Wounds may need antibiotics. If the wound develops pus, new discharge, an abscess, new redness or pain around the wound edges, is slow to heal, or any other important signs or symptoms, you may need further treatment of the wound. This may mean debridement by a medical professional or antibiotics or other treatments. Even if you seek care in a hospital, you may still be treated with honey. Many health facilities around the world do use honey as part of their wound care. You can talk to your healthcare professional about this. All of this said, simple wounds can now be treated with medical honey bandages, sold over the counter in many pharmacies and stores in the US and elsewhere. The honey may be already on the bandages or a gel containing medical grade honey can be applied directly to the wound. Wounds due to trauma and injury. These could be simple cuts or scrapes. Some wounds called pressure ulcers that can occur when someone lies in bed, not moving or being moved for a long time. This can occur when someone is very sick (such as in an intensive care unit), is paralyzed, elderly, or otherwise incapacitated (such as when under the influence). Others wounds that develop when blood flow is not good, especially on the legs and especially in the elderly and, in some cases, smokers. This can include venous stasis ulcers and arterial insufficiency ulcers. Wounds that occur in people with diabetes, especially on the feet. This happens especially when those with diabetes have nerve damage and don't feel a mild injury (such as from crumpled sock), which then leads to slow healing wound. The mismanagement and overuse of antibiotics has led to a looming problem—we're running out of the antibiotics needed to treat infections. Those infections that once responded to antibiotics now are their very own "honey badgers." The bacteria don't care; they keep growing in the face of antibiotics. Honey offers the chance to treat infections, both resistant and not resistant to antibiotics. Bacteria that are resistant to antibiotics are rarely "Super Bugs." They rarely are any more powerful than any other bacteria and, in fact, sometimes are weaker. It's just that these resistant bugs do not respond to antibiotics. Honey doesn't rely on antibiotics so it can help stop bacteria in its own way. This is like other new but old treatments we are rediscovering as we move closer to a post-antibiotic era. Phages (or viruses that infect bacteria) were used before antibiotics were discovered and are being increasingly examined as a new means of fighting bacteria when antibiotics don't work. This is also true of different antibody treatments. It may be that more types of treatments that were once considered alternative or complimentary become central and important to the fight against bacteria, as we begin to lose the ability to fight bugs with the antibiotics we have relied upon. Cooper R, et al. A Comparison Between Medical Grade Honey and Table Honeys in Relation to Antimicrobial Efficacy. WOUNDS. 2009;21(2):29-36. Jull AB, et al. Honey as a Topical Treatment for Acute and Chronic Wounds. Cochrane Review. March 2015. Journal of Lower Extremity Wounds. The Evidence Supporting the Use of Honey as a Wound Dressing International. March 2006 5: 40-54. Soffer A. Chihuahuas and Laetrile, Chelation Therapy, and Honey. Arch Int Med. 1976;136(8):865-866. UW Health 2008 Annual Report. A Sweet Alternative: Topical Honey Shows Promise in Healing Diabetic Ulcers.